Food cart. Roach coach. Taco truck. Everywhere but here, they’re all the rage.Los Angeles has the amazing Kogi BBQ truck along with a multitude of other gourmet trucks that roam the city, tweeting their whereabouts to avid followers. New York has Waffles & Dinges. Minneapolis has the Chef Shack. San Francisco has the crème brulee cart, Roli Roti and Chairman Bao. Portland and Austin have “pods” of trailers and trucks, usually staying put on random dirt lots and rented parking spaces downtown, all serving affordable gourmet and ethnic fare. Food trucks even rated their own reality TV show on the Food Network. Hosted by Tyler Florence, the show followed trucks as they raced across the nation, competing to see who could serve the most food and attract the most customers. Driving a big vehicle, owning your own business, expressing yourself through your craft…. Why, it’s the American dream! Sacramento? We’ve got an ordinance. What ordinance? Sacramento City Code, chapter 5.68 on food vending vehicles. The ordinance states that food trucks may not operate after either 6 or 8PM, depending on the month; that trucks not be stationary for longer than 30 minutes, after which they must move 400 feet, and must not be within 400 feet of each other. More than one truck cannot occupy the same piece of private property—even with the consent of the owner of the property. 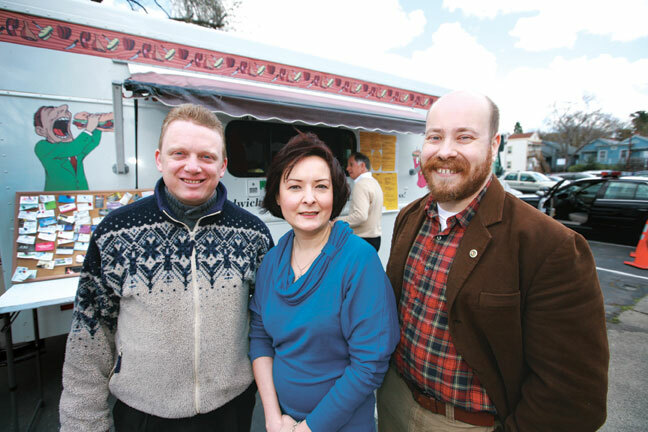 The food truck ordinance is effectively a ban on food trucks within the central city – a central city that struggles to cater to its potentially vibrant street culture and nightlife. Instead, the city would seemingly prefer to donate millions of dollars to a bar featuring a mermaid. Despite these obstacles, four Sacramentans have stepped forward to try to make sense of it all. Joshua Lurie-Terrell, of YumTacos.com, Catherine Enfield of MunchieMusings.net, Paul Somerhausen of the Sacramento Epicureans, and Costa Apostolos of the Friends of Fremont Park. Together they envisioned a festival within the city limits, with gourmet food trucks, taco trucks and food carts all co-mingling together happily, celebrating good food at low prices in a beautiful outdoor urban setting. Lurie-Terrell, Enfield and Somerhausen originally got together to discuss overturning the ordinance. After initially talking to the City Council and getting nowhere, it became apparent that actions could say more than mere words. The group decided to show the City Council that food trucks were not all fast-food and pre-packaged junk Word got out, sponsors jumped on board, and Matt Cohen of San Francisco’s Off The Grid (offthegridsf.com) provided generous amounts of time and advice—as well as some of San Francisco’s best gourmet trucks. 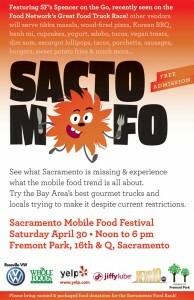 SactoMoFo – the Sacramento Mobile Food Festival – was born. At the time of writing, SactoMoFo has 18 trucks and 6 carts confirmed. Most of the trucks are coming from out of town—you might recognize a few from the news or television. Spencer on the Go, recently featured (and heartbreakingly eliminated on the second-to-last week after getting beat by $37) on the “Great Food Truck Race” will be here, serving up their garlicky escargot pastry lollipops and tender braised lamb cheek sandwiches. Also joining us from San Francisco is Chairman Bao, possibly the cutest truck I’ve ever seen. Another truck I’m excited about is The Red Truck (motto: “let your food flag fly”), coming down the mountain from. Their menu boasts Indian takes on classic American street food. Naan dog, anyone? Local trucks and vendors will be here too, notably the new-guy-in-town Mini Burger, along with Tacos Piedad, who normally set up shop outside of city limits on Northgate to avoid the ordinance. Mama Kim on the Go, coming to town from the ‘burbs is bringing us locally sourced soul food. A few local carts will be there too—Happy Go Lucky, the vegan cart that’s normally parked downtown on weekdays, as well as Fat Face, who will be selling their specialty ice cream. The four organizers hope to make this an annual event, and why not? These types of street food festivals have thrived elsewhere, even in the nearby bay area. The SF Street Food Fest. The Eat Real Festival, in both LA and Oakland. The Los Angeles Street Food Festival. Seattle’s Mobile Chowdown. Portland’s Eat Mobile Festival. All bustling and crowded family-friendly festivals, packed to the gills with a variety of food and happy eaters. These micro-businesses are licensed, inspected and pay taxes. In other cities, many truck owners have gone on to open storefront businesses. Some have become legend, as with LA’s Kogi BBQ—now the proud owners of five trucks roaming the city, tweeting to over 50,000 followers and now serving up their often-imitated Korean BBQ tacos at a storefront as well. 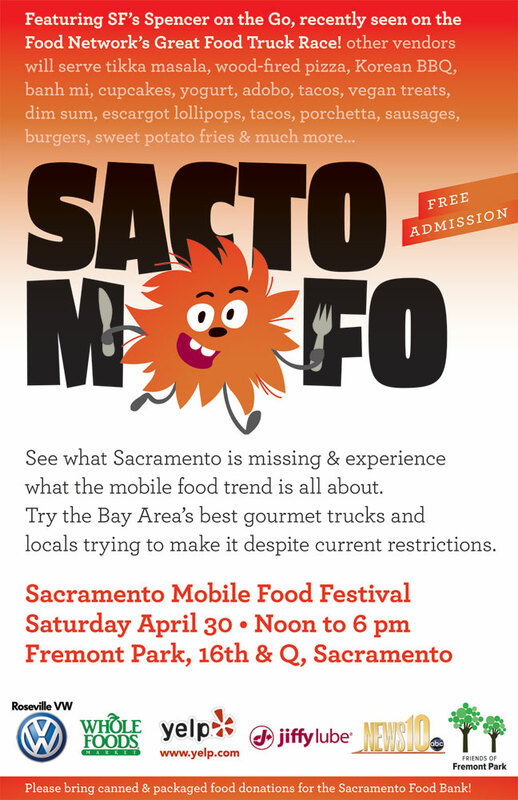 With Sacramento’s mild weather, plethora of parks and dearth of cheap late night eats; it’s quite simply shortsighted to continue to stifle the burgeoning food truck scene. Just imagine our fair city, complete with mobile food vendors. Got an unsightly empty lot? Rent it out to a couple of food vendors. Only have a 30-minute lunch and you didn’t get to La Bonne Soupe early enough? Stop by and grab a gourmet burger or a trio of tacos for $3. It’s 2AM, after a show, and you want a quick bite to eat? Let’s take a cue from Oakland and get our own bacon-wrapped hot dog cart—just like they have outside the Fox Theater. I see the economy turning around already.